If you’re a girl like me, you grew up playing with dinosaurs. When your sister tried to force you to play with her little Suzy dolls instead of dinosaurs, you made your T-Rex figurine bite Suzy’s arm off within a matter of minutes. My fascination for paleontology and dinosaurs began early and took off like a freight train. The house was filled with books about Mesozoic era fossils, “build your own wooden dinosaur” activities, and tiny plastic toys with sharp angles that my mother loved stepping on. I was determined to learn everything I could about dinosaurs. If anyone tried to challenge me I would cite every species I knew in alphabetical order, while maintaining intense eye contact. Many years later, the ardent passion (and toy collection) has dwindled, but I still feel an intense excitement over any dinosaur related discovery or activity. The sensational recent hardrosaur leg bone discovery near Palisade, Colorado, is prime example of how these great creatures of the past are still present in modern day times. Colorado is a hot bed for fossil finds and paleontological activity. In Mesa County’s very own Fruita Paleo Area, one can take an easy and enjoyable interpretive hike to observe a land once filled with dinosaurs and Late Jurassic species. Also in Fruita, Colorado, the Dinosaur Journey Museum offers a vivid look into the world of dinosaurs featuring exhibits with real fossils, hands-on interactive activities, and even a “quarry site,” where kids can uncover Jurassic dinosaur bones. You can visit this museum for free using one of the library’s museum passes which provides entry for up to six people. Mesa County Libraries’ very own current artist in residence Melody Brooke Safken is no stranger to the alluring fascination towards the incredible beasts of ancient Earth. 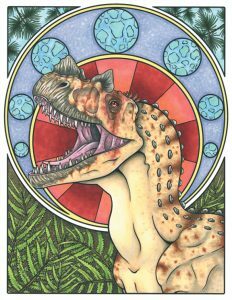 Brooke specializes in Paleontological Art and Creature Design, and creates beautifully rendered illustrations of dinosaurs. You can check out her work at the 970West Studio during open studio hours on Wednesdays from 11am to 3pm, or attend the library’s next event featuring her art: “Paleontology and the Art of Illustrating the Past” on Wednesday, October 11th. To explore further and brag to your friends about all your cool dino wisdom, visit our catalog for a plethora of books available on the topics of paleontology, fossils, and the Jurassic period. Dig in, fellow dinosaur nerds! Posted in 970West, Crafts and Hobbies, General, Local History, Programs/Classes.